In a frying pan, cook the beef mince with the chopped carrots and onion and salt. Add red wine and mix well. Mash the cooked potatoes with an egg, then place a spoonful of mash in a bowl lined with clingfilm. Push the mashed potato to the edge of the bowl and add a spoonful of meat into the middle, then twist the clingfilm closed around the potato. Roll the balls in flour, then fry them in hot oil. 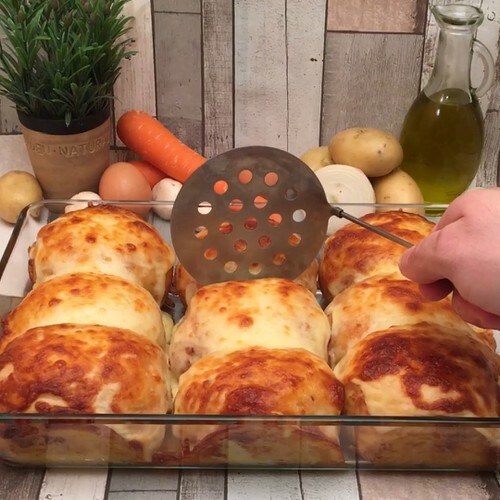 In an oven dish, arrange the balls side by side and place a slice of cheese on each ball. Bake for 15 minutes at 180°C and then enjoy.